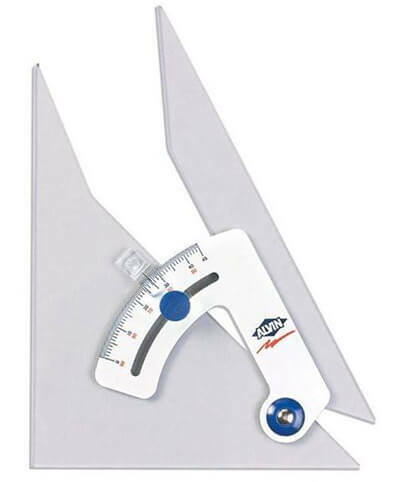 The Alvin Tru-Angle 6" Adjustable Triangle combines the features of a 45°/90° adjustable triangle with those of a protractor. Angles from 0° to 90° can be drawn from the baseline with 0.5 degree accuracy. Die-engraved graduations for high visibility. The aluminum thumbscrew securely holds the selected angle and allows quick pick up and manipulation. Made of high impact acrylic that is 0.100" thick and optically clear to eliminate parallax and allow close pencil tolerance.